Research Description: Prof. Ashutosh Kotwal's research focuses on the physics of fundamental particles and forces at high energies. He was instrumental with his team in discovering the Higgs boson at the Large Hadron Collider. The Higgs boson arises from a completely new mechanism, never before seen in Nature, to impart mass to all fundamental particles. While this discovery has solved a major fifty-year old puzzle in fundamental physics, it has brought a new set of questions to the fore. How does the Higgs boson happen to have just the required properties? What is Dark Matter, how is it related to normal matter and how is it produced? Is there a connection between Dark Matter and the Higgs boson? Finally, why is there more matter than anti-matter in the Universe, when the experimentally tested theory of particle physics called the Standard Model predicts that there should be no such imbalance? Prof. Kotwal is pursuing these questions experimentally using two approaches - precision measurements of fundamental parameters, and direct searches for new particles and forces. Prof. Kotwal is the US Coordinator of a global effort to build a very large hadron collider of 100-200 TeV in collision energy, in a circular tunnel of 100-200 km in circumference. This project is about five times bigger and 10 times higher energy than the LHC. In connection with this responsibility, he is also serving as the Head of the Future Collider Facilities Group at the Fermi National Accelerator Laboratory (Fermilab) in the US. He is heading an international study group of 300 physicists who are producing quantitative physics publications on the discovery potential of this future collider, and developing detector concepts using futuristic technology. Europe, China and the United States have shown interest in hosting this huge collider. Prof. Kotwal is coordinating this project with the leaders of US National Laboratories, the European CERN Laboratory and the Institute of High Energy Physics in China. Studies led by Prof. Kotwal’s group, and colleagues from Europe and China are showing that the Future Collider will have the capability to answer the Big Questions mentioned above. Let’s start with the Higgs boson. The Higgs boson represents a quantized wave, or excitation, in a new kind of fundamental matter that has never been observed before. To make it all the more intriguing, this discovery spawns two more mysteries. Firstly, based on the time-tested laws of Quantum Mechanics and Einstein’s Special Relativity, the properties of the newly discovered Higgs boson are truly bizarre. Its mass should have received very large corrections due to quantum effects. Under the principle of “Naturalness”, the explanation is that new physics principles at or below the 10 TeV energy scale automatically (naturally) make the quantum corrections small, allowing the Higgs boson mass to be as light as we observe. Three candidate theories for such new physics principles have been put forward; supersymmetry, extra dimensions of space, or a new superstrong force. The second mystery of the Higgs is that this new kind of matter fills all of space, a process called condensation. We have no explanation for how this condensate forms, but the answer must lie below the energy of about 10 TeV. As a bonus, the mechanism of forming the Higgs condensate can also answer the second Big Question - why is there more matter than antimatter in the Universe? All the known laws of fundamental physics are almost identical for matter and antimatter. The formation of the Higgs condensate offers a natural mechanism for locking in the excess matter into the condensate. The process is akin to droplets of water condensing out of water vapor, and the droplets coalescing to form a continuum of water. The analogous process would be the formation of the condensed state of the Higgs as the Universe cools after the Big Bang. The new principles and new particles associated with this condensation process would show up at the new, high-energy collider. The prospect of producing new particles associated with Dark Matter, at the future collider is extremely exciting. Many astrophysical measurements have confirmed that Dark Matter is four times as populous in the Universe as normal matter, yet we have not observed its interactions though any other force except the gravitational force. Yet we know that galaxies, stars and planets would never have formed without the gravitational attraction of Dark Matter in the early Universe. Since Dark Matter cannot experience the strong, nuclear interaction or the electromagnetic interaction, the only known possibilities are its interaction via the weak force or via the Higgs boson. These options can be thoroughly explored at the future, very high-energy collider. An even more exciting possibility is that Dark Matter is part of a totally new, “Hidden Universe”, in which Dark Matter and other particles experience none of the known forces, but interact via completely new forces and thereby can co-exist but remain hidden from us. The existence of Dark Matter may already be telling us about this hidden world, and the ability to peer into and touch this world with the future collider opens up unimagined possibilities. Given these prospects for revolutionary insights into the nature of the Universe, it is important for the US to maintain a leading position in particle physics and accelerators. Under Prof. Kotwal’s leadership, his group of US and international colleagues is articulating the detailed scientific arguments for constructing the future collider. He is also heading the design effort for new kinds of particle detectors whose capabilities will extend significantly beyond those built for the Large Hadron Collider. in order to resolve the tell-tale signatures of the new physical laws. In his own research, Prof. Kotwal leads the world in measuring very precisely the mass of the W boson, which is sensitive to the quantum mechanical effects of new particles or forces. In particular it is directly connected to the mysterious properties of the Higgs boson. If the latter are derived from a new, super-strong force hiding at very small distances, the quantum fluctuations associated with this new force will be revealed in a measurable change in the W boson mass. Using the data from the CDF and D0 experiments at Fermilab, Prof. Kotwal has repeatedly published the world's best measurements of the W boson mass. Most recently he achieved a precision of 0.02%, and it predicted the mass of the Higgs boson before its discovery at the LHC. Since the Higgs boson mass turned out to be in the range predicted by Prof. Kotwal, his measurement provides a spectacular confirmation of the Higgs theory. Prof. Kotwal's publications describe how he has progressively improved the experimental techniques for the W boson mass measurement. He now leads the effort to further improve on this precision, which can prove the existence of new particles or forces associated with the Higgs boson. Prof. Kotwal and his collaborators have also published the most precise measurements of the top quark mass in the dilepton channel. His latest measurement used, for the first time in particle physics, neural network algorithms based on biological evolution. The method mutates the neural network architecture randomly, just as genes mutate randomly in biological evolution. The better networks are retained and those with inferior performance are eliminated, a process emulating natural selection. i.e. "survival of the fittest". The surviving network architectures are used to seed the next generation of mutations, leading to evolution of the networks towards superior performance. This method showed how to solve certain optimization problems based on recognizing patterns in an ensemble of objects. Prof. Kotwal developed improved techniques to search for the Standard Model Higgs boson. On the CDF experiment at Fermilab, he published three papers describing the search for the Higgs boson, each time using more advanced techniques. He used one of these techniques for the first time in the ATLAS experiment at the LHC to search for the Higgs boson in a mode not yet observed. Prof. Kotwal also works with his students, post-docs and collaborators on searches of rare, exotic signatures of new interactions. He has published searches for charged and neutral gauge bosons mediating new weak forces, the Higgs boson in theories that extend the Standard Model, and excited states of Standard Model fermions. These particles are predicted in theories where the weak interaction has both left-handed and right-handed couplings (as is indicated by recent data on neutrino oscillations), in supersymmetric theories which impose a fermion-boson duality, and in grand unified theories. On the the ATLAS experiment at the LHC, Prof. Kotwal has performed detailed studies of the silicon and transition radiation detectors. His students have published searches for new particles decaying to top quarks as well as Higgs boson measurements. He wrote the first three ATLAS papers on searches for heavy resonances decaying to leptons. In addition to his experimental research, Prof. Kotwal has done theoretical work in the phenomenology of black holes in extra spatial dimensions. Extra spatial dimensions have been motivated by string theory and to explain why the gravitational force is so much weaker than the electromagnetic force at large distances. In this scenario it is possible for the gravitational force to be strong in the high energy regime of particle colliders, leading to the production of black holes. Prof. Kotwal has published a theoretical analysis of the production and decay of rotating black holes and their experimental signatures. Prof. Kotwal has also co-authored a paper on black hole relics, which are postulated to resolve the ``information paradox'' - after the black hole evaporates by Hawking radiation, where is all the information swallowed by the black hole during its lifetime? The information may remain locked up in these black hole remnants. Prof. Kotwal is the recipient of the Outstanding Junior Investigator Award and the Alfred P. Sloan Foundation Fellowship. He is a Fellow of the American Physical Society and a Fellow of the American Association for the Advancement of Science. He has served as project leader for analysis, software and computing on the CDF experiment, and now heads the experimental particle physics research group at Duke. He has served as the Physics Advisor for the US ATLAS Collaboration of 44 US institutions on the LHC. He served as the Chair of the Fermilab Users Executive Committee,the DPF Nominating Committee, and Duke University's Information Technology Advisory Committee. He has served as the Associate Chair of the Physics Department. Prof. Ashutosh Kotwal's research focuses on the physics of fundamental particles and forces at high energies. One of the outstanding mysteries is the mechanism by which particles acquire mass. The theory of gauge symmetry has been very successful in describing the known fundamental forces; however this theory is obviously incomplete because it requires all particles to be massless. Clearly we are missing a big piece of the puzzle. Prof. Kotwal is pursuing this question experimentally using two approaches - precision measurements of fundamental parameters, and direct searches for new particles and forces. Prof. Kotwal leads the effort to measure very precisely the mass of the W boson, which is sensitive to the quantum mechanical effects of new particles or forces. In particular it is directly connected to the mass of the Higgs boson, which is the quantum mechanical excitation of the Higgs field which imparts all fundamental particles their mass. Using the data from the CDF and D0 experiments, he has developed new experimental techniques for performing precise calibrations. He has published numerous measurements of the W boson mass with increasing precision, most recently achieving a precision of 0.02%. This is the world's best measurement, and it predicted the mass of the Higgs boson which is compatible with the measurement of the Higgs-like boson discovered at the LHC. Within the current precision, Prof. Kotwal's measurement provides a spectacular confirmation of the Higgs theory. His previous publications describe how he has progressively improved the experimental techniques for the W boson mass measurement. He now leads the effort to further improve on this precision by a factor of two, which can prove if new particles other than the Higgs boson also exist. Prof. Kotwal and his post-doc Bodhitha Jayatilaka and collaborators have also published the most precise measurements of the top quark mass in the dilepton channel. His latest measurement used, for the first time in particle physics, neural network algorithms based on biological evolution. This method showed how to solve certain optimization problems based on ensemble properties. Prof. Kotwal is pursuing improved techniques to search for the standard model Higgs boson. On the CDF experiment at Fermilab, he has published three papers describing the search for the Higgs boson, each time using more advanced techniques. He is now using one of these techniques for the first time in the ATLAS experiment at the LHC to search for the Higgs boson in a mode not yet observed. Prof. Kotwal also works with his students, post-doc and collaborators on searches of rare, exotic signatures of new interactions. He has published searches for charged and neutral gauge bosons mediating new weak forces, the Higgs boson in theories that extend the standard model, and excited states of standard model fermions. These particles are predicted in theories where the weak interaction has both left-handed and right-handed couplings (as is indicated by recent data on neutrino oscillations), in supersymmetric theories which impose a fermion-boson duality, and in grand unified theories. Prof. Kotwal's research program spans both the CDF experiment at Fermilab and the ATLAS experiment at the LHC. Prof. Kotwal is performing detailed studies of the silicon and transition radiation trackers of the ATLAS detector. His students on ATLAS are working on searches for new particles decaying to top quarks as well as Higgs boson measurements. He wrote the first three ATLAS papers on searches for heavy resonances decaying to leptons. In addition to his experimental research, Prof. Kotwal has done theoretical work in the phenomenology of black holes in extra spatial dimensions. Extra spatial dimensions have been motivated by string theory and to explain why the gravitational force is so much weaker than the electromagnetic force at large distances. In this scenario it is possible for the gravitational force to be strong in the high energy regime of particle colliders, leading to the production of black holes. Prof. Kotwal has published a theoretical analysis of the production and decay of rotating black holes and their experimental signatures. 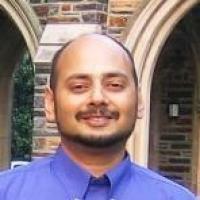 Prof. Kotwal has also co-authored a paper on black hole relics. Prof. Kotwal is the recipient of the Outstanding Junior Investigator Award and the Alfred P. Sloan Foundation Fellowship. He is a Fellow of the American Physical Society and a Fellow of the American Association for the Advancement of Science. He has served as project leader for analysis, software and computing on the CDF experiment, and now heads the experimental particle physics research group at Duke. He served as the Chair of the Fermilab Users Executive Committee and the DPF Nominating Committee. He is currently the Chair of Duke University's Information Technology Advisory Committee and the Associate Chair of the Physics Department.